This oven baked BBQ chicken will hit the spot when it's cold outside or when you don't want to grill it. 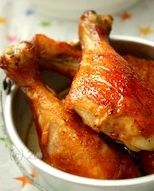 Offering my favorite homemade barbecue sauce recipes and many more easy chicken recipes for you to call your own. A tasty chicken recipe by Paula Deen. Mix sauce ingredients together and reserve 1/3 of the sauce for later. Place chicken pieces in a resealable bag and add sauce. Shake and place in 9x13 pan. Bake for 45 minutes. Remove chicken and top with the remaining barbecue sauce. Bake for another 15 minutes or until juices run clear. These potatoes are great with the chicken. Just add a fresh salad and you have a delicious meal.